SAN FRANCISCO, October 12, 2016 /PR Newswire/ – On September 27, 2016, San Francisco Salt Company was honored with its fourth consecutive Bizrate Platinum Circle of Excellence award. 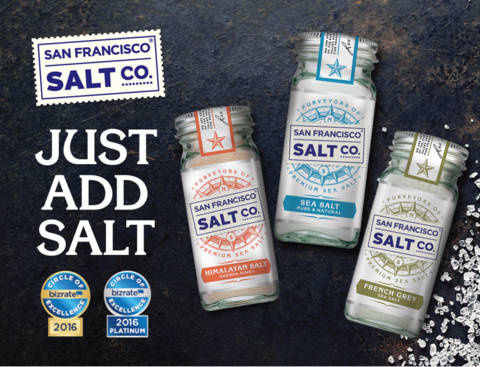 San Francisco Salt Company is one of the 2.7% of retailers in North America to receive the award, presented annually to participating retailers in recognition of their outstanding customer satisfaction. San Francisco Salt Company specializes in a variety of natural sea salt products for culinary, health and spa use. They are currently one of the largest suppliers of Epsom salt in the United States and recently launched their new Epsoak Sport® line, formulated specifically for post-workout athletic recovery. Bizrate conducts surveys for more than 3,500 online retailers in North America, gaining verified consumer insight. The award criteria are based on direct customer feedback, comprised through the analysis of independent ratings and reviews surveys. Bizrate’s voluntary survey is presented to customers immediately following checkout on the participating company’s website. If a point of sale survey is completed, the customer also receives a fulfillment survey, after the expected delivery date of the order. Eligibility for the Circle of Excellence award is measured with seven customer satisfaction metrics: point-of-sale including 1) overall satisfaction, 2) product selection, and 3) ease of finding and post-order-fulfillment including 4) repurchase intent, 5) product met expectations, 6) customer support, and 7) on-time delivery. San Francisco Salt Company was among the 97 winners of the Platinum Circle of Excellence Award in 2016, , given for reaching at least a 9/10 score in all of the seven indicators. San Francisco Salt company is in its 14th year of operation. The company has been growing its team and after a three-year sales growth of 266%, was ranked 1439 on the 2016 Inc. 5000 list. San Francisco Salt Company is one of the most successful and fastest growing companies within the independent small business market. Launched in 2002, the San Francisco Salt Company was the founder's entrepreneurial dream and embodies his principals of quality, value, and customer service. They are a major supplier of Epsom Salt, Himalayan Salt and Dead Sea Salt and offer a diverse line of products made from sea salt, including gourmet specialty salts and bath & spa salts, available in bulk and retail sizes. For more information, please visit www.sfsalt.com or find the brand on Facebook, Twitter, and Instagram.